After a long period of being entirely full, an office has now become available at Highstone House, giving a rare and exciting opportunity for your business to relocate to this superb location. As one of Barnet’s most sought after serviced offices, you will need to be quick if you want to join a number of companies who have built up successful businesses here at Highstone House! 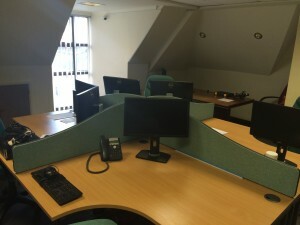 The available office is bright, modern, comfortably seats four or five people and is located on the second floor of the building, overlooking the High Street. Just a short walk from High Barnet tube station, the office has excellent transport links and your team and clients are just a short journey away from central London. It is also just a ten minute drive from the M25. Parking may be available on site at an additional charge – let us know you would be interested when you inquire – and there is also an abundance of parking nearby, including a reasonably priced car park only a five minute walk away. Serviced offices are a refreshing alternative to the usual office set-up – you don’t need to worry about getting your phone line and broadband set up as all that will be sorted out for you so you can arrive on day one and get working. Our highly experienced and professional receptionist is on hand to greet your clients and let you know when they have arrived. Your mail will also be delivered to you promptly and, should you require secretarial services, then our receptionist can also take care of this for you, without you having to go through the process of employing someone else. The area is home to some great pubs and restaurants should you need to wine and dine a client or celebrate a success with your team and a lunch break could be spent enjoying the wildlife in King George’s Fields. The Spires Shopping Centre is also very close by if you need to grab a few bits before you head home. Vacancies do not come up very often here, so give us a call and see if we could be your company’s new home. Fibre optic broadband has arrived!